Turn back the clock by rewarding yourself with an amazing facial treatment. Here at Espirit de Vie, our facial experts specialize in facial treatments that are designed to treat all types of skin. Make an appointment today and discover beautiful, radiant skin! An express treatment to skin revival. Includes analysis, cleansing, exfoliation, extractions, masque and hydration. A skin analysis is provided in order to make sure that you are using the correct skin care products. This will be accomplished with maintenance, repair and prevention products. This replenishing facial is designed to revive, nourish and restore your skin’s vibrancy and radiance. This deep cleansing enzyme-based anti-aging facial is specially designed to nourish, replenish, eliminate impurities and take care of dead cells. Made from pure cranberries. Ideal for all skin types but especially sensitive and irritated skin. Engage your senses and address your specific skin care needs. Aromatherapy calms the mind, while the sound melts away stress in your body. This facial is like no other. Specially designed for oily, problem and blemished skin. This treatment helps to regulate oil production, oxygenate the skin and reduces the appearance of large pores. 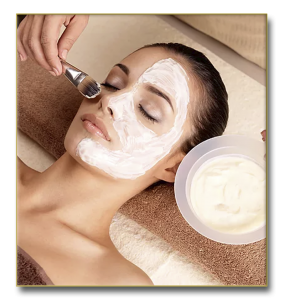 This gentle facial treatment is designed to make you feel and look good with special products and soothing touch. Your sensitive skin is cleansed, exfoliated, calmed with a masque, followed by serums, toner and moisturizer. Paraffin softens and hydrates the skin and diminishes stress for days. This treatment will plump up the skin and give you a more youthful appearance. 60 min.